Empties of the month: August 2018! Hi girls! Last week was a blast! I was hosting a good friend from HK, sunbathing and having drinks all day, saying goodbye to summer. Now, after few days of recovery, here I am with another "empties of the month"! 1. L' Oreal Elvive Extraordinary Oil, Coconut Oil, Multipurpose hair mask. 300 ml: I swear on this mask! I used it this summer for the first time and loved it. The scent is deliciously sweet and lingers on my hair for days. The texture is thick (like a body butter) and I needed a very small amount for my hair, so it lasted three months with regular use. I love that this mask can be used in so many different ways, as you can either apply in the shower, before styling, before the shower, as a night mask or for a refreshing touch during the day! It is super moisturizing and works wonders on tangled hair! One of the best hair masks I've ever tried and super affordable! 2. Avene Emulsion SPF50+ 50ml: Avene is an all time classic for me on sunscreens. I suffer from clogged pores and break outs and most sunscreens make my complexion greasy. Avene's products are water based and contain their famous thermal water that soothes the skin and protects from irritations. As an oily skin type I need this exact kind of products and I highly recommend this for girls with troubled skin! 3. Natura Siberica Organic Shop Vanilla & Orchid Body Mousse 250 ml: I had this body mousse since last summer and tried so hard to consume it. I ordered a beauty box back then and this was one of the products included. I adore Natura Siberica and Organic Shop, but this body product was disappointing. It smells so artificially and the consistency is so watery. The packaging looks cheap and the plastic is very flexible, making the whole experience even worse. I don't recommend this and will not purchase again. 4. Natura Siberica Northern Soap For Deep Facial Cleansing 120ml : Girls, this is definitely a keeper! This soap mask went very famous when won the "Best face cleansing product" award in France, 2014. I first bought it two years ago and I am very satisfied. This mask provides a deep detoxification due to activated charcoal and cleanses pores without leaving your skin dry at all. It can be used either as a face soap, or a face mask. The packaging is very luxurious to me, and comes with a little black sponge. The only thing I don't really enjoy is the scent (bitter almond), but I can handle it. I am repurchasing again and again! 5. Natura Siberica Body Desserts Summer Fruit Ice Cream Cleansing Body Peeling Cream 450ml: Body Desserts by Natura Siberica are an obsession! I find myself trying hard not to eat them! This summer treat is a creamy body scrub and comes in a generous and fancy packaging! It smells like all the fruits you eat during summer! It contains oils and extracts from peach, strawberry and raspberry and has hard grains of salt to soften and exfoliate. The amount of product is huge and you need only a small one for every single application, so it lasts for a long time. Also it's made from certified organic ingridients! What else can we ask for? 6. L' Oreal Fine Flowers Cleansing Milk 400 ml: I bought this product with the wrong criteria. I adored the smell! Seriously smells so floral and heavenly clean. But this product appeals to dry and sensitive complexions while I have oily and acne prone skin (bad bad choice). Anyway, I still enjoyed using it, but I managed to wash it off thoroughly and never leave it soak into my skin. As a make up removing product is ok but , still, it's wise not to buy products just for the smell! So I think I won't keep buying this one. 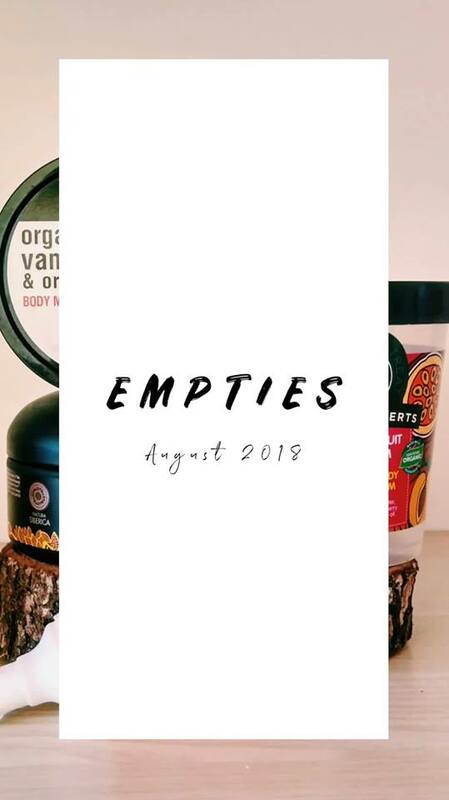 Thank you for reading my August empties, hope this was enlightening and motivating for new skin care experiences! Mary R : Hi Una!!! If I had to choose only one it would be the northern soap! I think you will love how it cleanses your skin while leaving it soft and not dry at all. Generally, I recommend to try out more Natura Siberica products in the future, you will adore this company!